Jake uses Code: Green as his cleaning agent. This product will be used to clean your carpet, upholstery or any other fabric Jake cleans. Code: Green is powered mostly by hydrogen peroxide, meaning it will neutralize alkaline of other carpet cleaning agent residue. 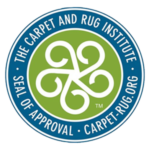 This may be a “green” product, but it has been fully tested and proven to actually clean carpet and upholstery better than other agents. Carpets are deodorized and left cleaner and softer than before! This product is recommended to clean commercial offices, schools, and other enclosed buildings.